It was supposed to be a fun day, getting a break from the daily grind to go to Disneyland, Knott’s, Six Flags or Universal Studios. It indeed was fun – until the accident. You remember screaming and bending over in pain. Everything after that was a fearful blur of people yelling, park staff running, paramedics asking questions, a surreal ambulance ride and a seemingly unending time in the ER. Los Angeles’ many theme parks provide joy to millions of visitors each year; Disneyland alone sees around 16 million annually. However, on the day you went, something went quite wrong. It may have happened on your favorite roller coaster, one that you’ve ridden a zillion times. On the other hand, it may have occurred on a ride that you had finally worked up the courage to attempt. Regardless, you ended up in severe pain, with the inconvenience of multiple medical visits, and with medical bills that have put stress on your financial situation. Your suspicion that someone else’s carelessness or recklessness may have caused your accident makes you feel even worse. If this has happened to you or someone you care about, call us now at the Law Offices of David Azizi at 800-991-5292. David is an experienced and effective amusement park injury attorney, and he stands ready to assist victims of negligence, just as he has for 21 years. We’re available any time of day and any day of the week, 24/7, and when you call, we will quickly connect you with David for a free consultation. In fact, you don’t pay him anything until he wins your case, and if somehow he doesn’t, you won’t owe him anything at all. With an outstanding 98-percent success rate, he is confident that he’ll be able to help, regardless of whether you were hurt in an amusement park incident, a water park accident or some other similar, serious mishap. Numerous residents of the greater Los Angeles area have chosen David as their personal injury attorney. They’ve done it for three major reasons. First, he has proven himself over many years of taking on the big corporations that want to lowball victims of their staffers’ negligence. Second, his knowledge of the issues is second to none, and third, though he has practiced law for so long, he is a genuinely compassionate attorney. You can trust your theme park accident case to David. He has been taking on big corporations and government entities since 1998, winning many multimillion dollar judgments and settlements for his clients to cover their past and future medical expenses. Every case is unique, though, and these amounts vary based on the particular circumstances of each accident. Call us today so David can give you an honest assessment of how much you deserve to receive in financial compensation. David’s peers affirm his effectiveness at winning maximum amounts for his clients. The large legal services company Avvo rates him “Superb,” and Expertise.com lists him as one of the Top 20 Personal Injury Lawyers in Los Angeles. More recently, the prestigious legal organization Super Lawyers named him, for the sixth time, one of the best attorneys in Southern California. David has proven himself to be tough on big companies, but his legal expertise is also second to none. We believe that no attorney knows the ins and outs of personal injury law better than David does. Here, he answers the question of what conditions warrant litigation following amusement ride accidents. In particular, he references an accident at Six Flags Magic Mountain in which a large tree branch fell onto the track of the Ninja, causing the roller coaster to derail. The nearly two dozen riders, several of whom were injured, were also stranded four stories above the ground for over two hours; two of the passengers were later briefly hospitalized. I Was Injured at a Theme Park. 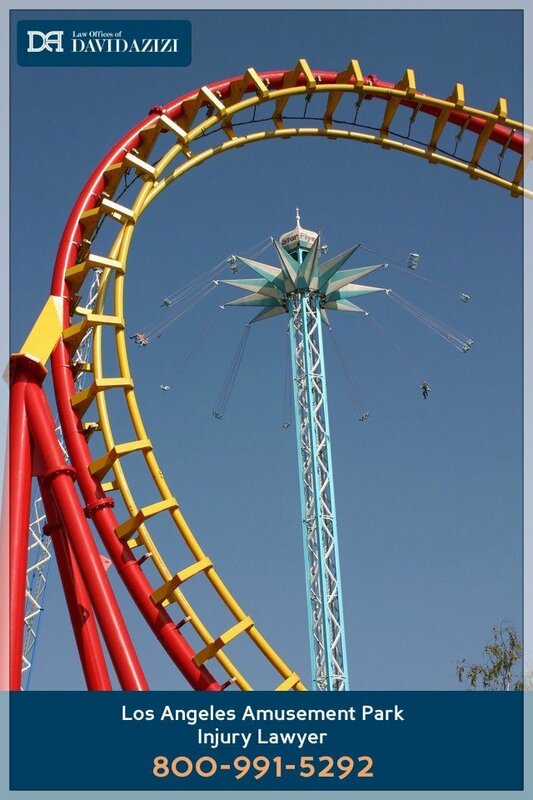 Can I File a Lawsuit?Under what conditions can you bring a lawsuit if you're injured on an amusement park ride? David explains, referencing a recent accident at Six Flags Magic Mountain, just north of Los Angeles. The circumstances of each case are unique, and settlement amounts vary accordingly. Contact the Law Offices of David Azizi to discuss the particular details of your situation. We are available 24/7 for a free consultation at 1-800-991-5292 or via live chat on our website at https://www.azizilawfirm.com. The courts have also held that amusement parks are held to a higher standard of safety as a common carrier, a legal term that also applies to entities that operate airplanes, buses and trains. Thus, theme parks must follow more thorough procedures to ensure rider safety. When L.A.-area amusement park accidents occur, be they at Disneyland, Knott’s Berry Farm, or any one of the other theme parks in the region, they often result in injuries that require medical treatment and even hospitalization. A recent survey of attorney-filed lawsuits against Disney and Knott’s in Southern California revealed that one third are related to slip and fall or trip and fall cases, which often result in broken or fractured bones. The lawsuit in the survey that produced the largest verdict against Disney involved a woman who suffered seizures after a large patio umbrella, blown over by a wind gust, hit her in the head. A jury awarded her $546,000. Yet even more tragically, ride accidents can also result in a loss of life. The most recent fatal accident at Disneyland that was ruled a case of negligence happened in 2003 when Big Thunder Mountain Railroad derailed, hurting 11 passengers, one of whom died of his injuries. At Knott’s Berry Farm, a woman died from an accident on Perilous Plunge in 2001; Cedar Fair and the ride manufacturer were found by a civil jury to be at fault for her death. We trust that David’s proven toughness and expertise will be just what your case needs. He handles more than just typical theme park mishaps, though. He also will successfully represent you in specialized cases too. Many of the 4,400 or so injuries that happen to kids at American amusement parks every year take place at water parks. The Los Angeles area features several highly popular water-themed amusement parks, including Knott’s Soak City, Six Flags Hurricane Harbor, Great Wolf Lodge and Raging Waters in San Dimas. Many incidents are caused by what you would expect: slip and fall accidents from wet surfaces. However, broken water slides, harmful bacteria and chemical imbalances in the water also account for a number of injuries and illnesses. Essentially, many water park mishaps happen because of the same problems that afflict non-water amusement park rides – that is, flaws in design, construction, maintenance and inspection. 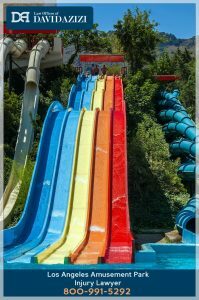 As water parks, like non-water theme parks, try to make their attractions ever more exciting, they build slides that are taller, faster and more thrilling than ever, increasing the risk to park patrons. If you’ve been injured at a water park, and you suspect negligence may be a cause, contact us, and David can help you assess whether you have grounds for a lawsuit. The most recent fatality from a carnival or county fair attraction in the greater Los Angeles area took place in May 2015. Sadly, a 31-year-old Navy veteran, recruiting for the armed services at the San Bernardino County Fair, died after falling approximately 30 feet on an inflatable attraction similar to a bounce house. Surprisingly, a local news investigation discovered that there is no government agency inspecting such attractions to prevent carnival ride injuries. The federal Consumer Product Safety Commission (CPSC) inspects mechanical carnival and fair rides that are portable and temporary. The state of California’s Amusement Ride and Tramway Unit inspects permanent rides like most of those at Disneyland. However, there are no federal or California state regulations to govern inflatable attractions, including bounce houses. 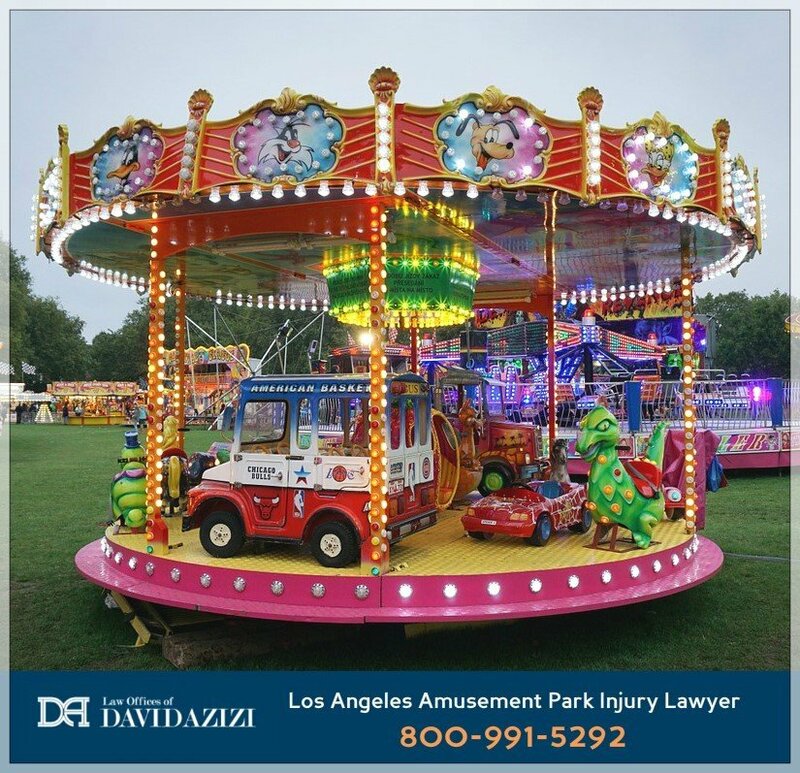 If you have suffered an injury at a carnival or county fair from a ride or other attraction, contact us, and David will be able to help you determine whether you have a case for legal action. Theme Park Negligence at HalloweenHow are Los Angeles-area amusement parks especially negligent toward visitor safety at Halloween? David discusses a common problem at theme parks like Knott's Berry Farm, Universal Studios, Disneyland, and Six Flags Magic Mountain. The circumstances of each case are unique, and settlement amounts vary accordingly. Contact the Law Offices of David Azizi to discuss the particular details of your situation. As David says, if an amusement park fails to properly train its employees, then injuries to park visitors are likely to occur. If you believe park negligence may have caused your injuries, regardless of what type of harm you suffered, do call us. 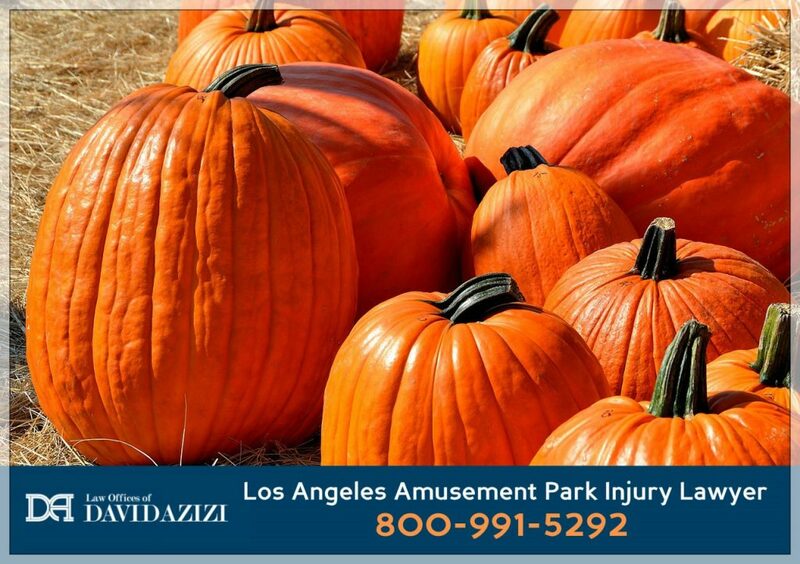 We will connect you with David to discuss your Six Flags, Knott’s or other Halloween theme park accident from a legal perspective. David is superb at fighting for every dollar you deserve to recover because of your accident. He’s also a genuinely compassionate lawyer for his clients. In June 2016, a toddler died after being attacked by alligators at a Disney hotel in Florida. When David heard the story on the news, he was devastated. You can be sure that when you hire David as your attorney, you aren’t getting a hardened and jaded lawyer. You’re getting someone who is truly sympathetic to what his clients are going through. As a married father of three young children, he especially feels it when the case involves a child. That’s partly why David makes it a priority to be accessible to his clients. He gives each client his cell phone number because he knows questions will come up. He also handles each case personally, working just as intensely on the smaller ones as the larger ones. To begin your free consultation with him, we urge you to call us 24/7 at 800-991-5292. If your amusement park injuries were caused by someone else’s carelessness or recklessness, David is confident that he will prove it, winning for you the compensation you need.